Her name was Mary Britton Miller but she wrote under the name Isabel Bolton, a little-known American writer who lived from 1883 to 1975. She wrote children’s poetry and stories and a handful of novels. 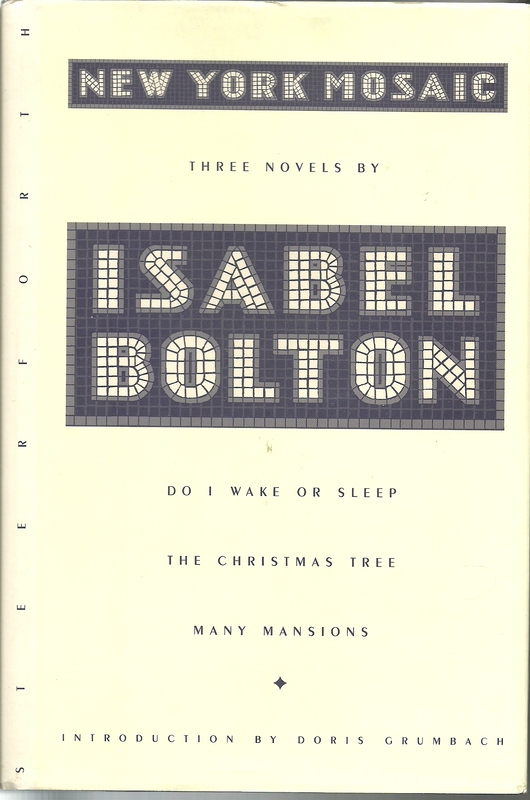 Three of her short novels (Do I Wake or Sleep, The Christmas Tree, and Many Mansions) have been collected into one 400-page volume under the title New York Mosaic. Not much happens in Do I Wake or Sleep (first published in 1946), the first of the three short novels in New York Mosaic. The story (or what there is of one) centers around an “older” woman named Millicent. She has come from humble beginnings but has somehow managed to live in a luxurious New York apartment amid the skyscrapers. She and all her friends are angst-ridden because World War II is in progress and they are all worried about the fate of the world. Millicent’s friend Bridget has a retarded daughter living in Vienna (“my little cretin”) who might be in danger because she’s living with Jewish relatives, and the Nazis…well, you know what the Nazis were doing. In spite the danger that Bridget’s daughter might be facing, Bridget is “gay” all the time, attending parties in her fancy clothes and running around with the smart set. Bridget tells her friends that being a society girl is the only way she can deal with the problems of the world. Then there’s Percy Jones, a novelist of some renown and a drunkard. He is fascinated with Bridget and everything about her, but he is so much older than she is and knows he doesn’t have a chance with her. Millicent is concerned about Percy and is thinking about marrying him herself to get him to “settle down” and stop fussing over Bridget. There is an altercation at a cocktail party that comes about as the result of a misunderstanding. Percy is injured when he is knocked to the floor. That is the big dramatic moment in the novel. The Christmas Tree (first published in 1949) is my favorite of the three novels. It has much more “bite” than the other two. Hildegard Danforth, another New York matron, has a young grandson named Henry and, since it’s Christmas, she wants to give him a beautiful Christmas tree. Larry, Henry’s father and Hildegard’s son, is gay. Anne, Henry’s mother and Larry’s ex-wife, sends Larry a telegram telling him that she has just married a flyer and they are on the way to his mother’s apartment in New York to spend Christmas. (The reason for the telegram isn’t clear, unless it’s to taunt him.) For some unexplainable reason, Larry also heads for New York for Christmas. He has just left his gay lover, Gerald Styles, and doesn’t seem to know where to go or what to do. Gerald follows Larry to New York without Larry knowing. All the characters converge on Hildegard’s apartment on Christmas Eve. When Henry sees Larry, his father, he wants nothing to do with him and tells him he hates him. Larry is crushed while the stepfather seems very smug. The tragedy that occurs on the terrace, sixteen flights up, is probably not what you would expect for a novel from the 1940s. In Many Mansions (first published in 1952), an eighty-year-old woman, Margaret Sylvester, is re-reading a novel she wrote about her life when she was younger and is reflecting on all the things that happened to her in her life. She is born into a wealthy New York family where everybody has plenty of money and plenty of leisure to do as they please. When she is a young woman, she has a summertime romance with an uncle by marriage and finds herself pregnant. Her family is forgiving, but they whisk her off to Europe for a year or so, where she gives birth to the baby without anybody knowing. The baby is put up for adoption and it is as if the entire episode never happened. (The baby’s father, her uncle, never knows.) Her life after the baby takes a different course than what is expected of a girl of her class. She has plenty of money to live on, but she takes up with some radicals and union organizers and becomes politically active with the intention of ending war, improving conditions for workers, and making the world a better place. Her family doesn’t approve. During this time, she has “very close” relationships with other woman (read into that what you will). Years later, after she has moved on from political activism, she buys a large old house, which she renovates to her own use. She rents her basement apartment to a young man, who promptly, against Miss Sylvester’s wishes, moves his pregnant girlfriend in with him. By a quirk of fate, she discovers that the young man was the baby she gave up for adoption all those years ago. He never knows that she is his mother, but she settles a large sum of money, apparently anonymously, on his child, her grandchild. Isabel Bolton’s writing is dense, wordy, old-fashioned by today’s standards, and not easy to read or digest. She loves the compound-complex sentence with many clauses. With a lot of her sentences, you have to go back and break down the various clauses to figure out what she is saying. For the serious reader, New York Mosaic is engaging enough to recommend it, but the casual reader will probably find it not worth the effort.